Here's a new band, more of a project, started by Ontario, Canada, guitarist Tom Frelek. He set out to create a progressive metal band beginning with his own songs and arranged around his significant guitar skills. Then he found that he needed some help to pull the final project together. He passed demos to, respectively, drummer Marco Minnemann (Necrophagist, UKZ, et al), Dream Theater bass player Mike Lepond, and Darkwater vocalist Henrik Bath. They all liked what the heard and came on board. 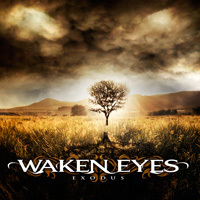 The result is Waken Eyes and the debut album Exodus. With little doubt this a guitar-centered album, merely listen to the starts and stuffing of Palisades, Cornerstone, Across The Horizon, or the deft instrumental Still Life. Frelek merges riffage, lots of it, with moments of acoustic and electric lightness and then peppers it with frighteningly immense solos. In the aforementioned Across The Horizon, at the start, those elements are layered, like waves rolling upon and around each other. Then the riffage take over, and the first solo swells. You might call it a pattern, lightness juxtaposed with intensity. But then there's the Deafening Thoughts, a blistering monster of riffage, booming drums, and thundering bass, with solos to ravage your ear drums. There's no moments of quietness or levity here as the song lives up to its name. Alternatively, with the open instrumental and the later Back To Life, Frelek gives the arrangements a light symphonic touch with faux orchestration, while heavy metal remains and his leads perpetuate. The curious piece here is the nearly 20 minute title track. Even with its light start, it's all about Frelek and his guitar, evolving into crushing riffage accented my more ambitious solos. Vocals are slight, a mere side thought it seems. Largely, the entire song is overwrought excess on Frelek's part. By way of summation, Exodus is all rather ambitious progressive metal. Yet, here's the dilemma in all this: it never felt very accessible. Nothing seemed to grab my attention like a catchy melody or a lyrical twist in a chorus, most drowned out by Frelek's heavy arrangements. Talent notwithstanding, Exodus seems to be all about the advancement of Frelek's skill and ability to wow us with technical geekery. Nevertheless, while I don't see myself making many, if any, return visits to Exodus, I do think Frelek accomplished his goal. He's created an album of melodic, often intense and intricate, progressive metal revolving around his talent for song composition and guitar wizardry. If you're into those things, this album is definitely worth your time. While I don't see myself making many, if any, return visits to Exodus, I do think Frelek accomplished his goal. He's created an album of melodic, often intense and intricate, progressive metal revolving around his talent for song composition and guitar wizardry. If you're into those things, this album is definitely worth your time.